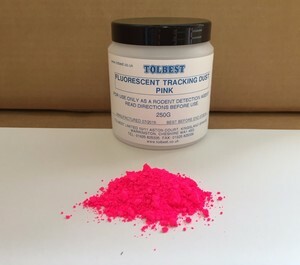 Fluorescent Tracking Dust for use in rodent detection and movement in cases where the pattern of activity needs to be monitored. Available in Yellow, Pink and Blue. 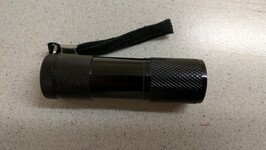 A very small quantity of powder can be placed around the suspect area and can then be left overnight and the following day movement can be easily seen. This product is only recommended for use in areas where the residue can be easily cleaned. Care should be taken in domestic situations. In most cases the footprints left can be see easily. The use of a fluorescent UV lamp can greatly increase the amount of movement that can be seen. In most cases any residue can be removed by washing with a suitable cleaning agent.